My two boys go through a very large amount of snack food every week. I hate buying everything pre-packaged so I try to find as many from scratch snack recipes as I can. 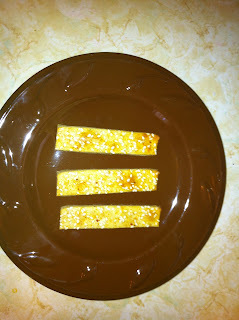 One of the recent issues of Martha Stewart Everyday Food had a recipe for Cheesy Chickpea and Sesame Crackers that looked promising. The recipe is very simple and easy to follow and uses ingredients that would be available at almost any supermarket (even my Kroger). I did have to add more than the recommended three tablespoons of cold water to the dough, I used another 2 tablespoons. Without the additional water the dough would not have come together properly. I would also recommend topping the crackers with salt before going in the oven, they were lacking the slightly salty flavor which most crackers have. For fun my husband added bacon salt to the top of a few of the crackers. I wasn't sure what the outcome would be, but the end result was good and added the necessary salt flavor without being over powering. It would be a fun addition that I would try again. I did notice that the next day after I made the crackers that the only ones still crisp and not soft, were almost burnt looking. I would recommend putting the crackers back into the oven to crisp them up before eating them again. I'm on the fence on this recipe because of how they taste after sitting overnight, I think I would use this for a party where they would be consumed right away and stay crisp, not for an everyday snack food. 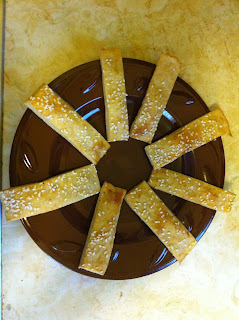 To find the recipe go to Cheesy Chickpea and Sesame Crackers.